My kids love coloring with chalk, inside or out, and I have to admit that I find it kind of fun too. One cold and snowy winter, I painted a series of 3 chalkboards on our basement wall. The kids have had a lot of fun with these. Since then I have made a few more that I've used elsewhere around the house. 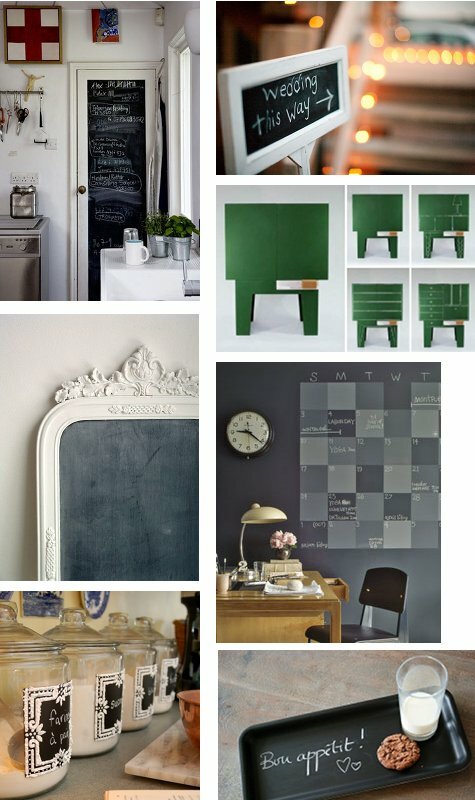 Here is a simple tutorial on how to use chalkboard paint to make your own! 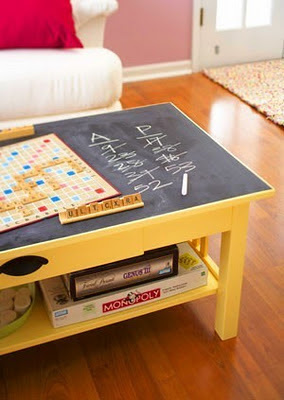 For all of these projects I used 'Rust-Oleum's' chalkboard spray paint. In the basement I used painters tape to mark my shapes on the wall. When I was ready to spray I also used a large piece of cardboard along the taped edge and a large drop cloth on the floor. Holding your cardboard around the edges as you go in your left hand, use your right to wield the can! Hold it about 10-12 inches from the surface of the wall and spray light even strokes. I did about 3 coats per project letting it dry for about 10 minutes in between each. For chalkboards that I could hang I went to my favorite store, Goodwill. I found this large super ugly piece. Its a framed apron. Not a cute one but a horrible one that left me wondering. (Seriously, why would someone frame such a thing) I liked the size and the design of the frame, so it made the perfect subject. After removing the back and taking the ugliness out (revealing an even uglier mauvey print) I cleaned the glass front and layed it on my drop cloth. Using the same technique spray the glass (or mirror if you choose) with 3 even coats. Paint the frames in any color. This one is in my son's "workshop". We use this one in the kitchen for verses, menus (if we're being fancy) and to make a gratitude list with the kids occasionally. This one was once a mirror. I saw a picture on 'Pinterest' of the inside of a pantry door that was painted with chalkboard paint. Since we are in the middle of painting our kitchen cupboards I'm thinking that this is the perfect idea for the inside of my pantry door, and inside my baking cupboard. I always keep measurement conversions, my chocolate chip cookie recipe, and a buttercream frosting recipe that I use for everything taped inside. Chalk would be a great way to include these things that would look a little nicer than my taped up hodge-podge. So many good ideas, so little time! Happy chalking! I love the idea of painting on glass or mirror, but when I tried it the chalkboard (spray paint) peeled off. What's your secret? I'm not sure, I've never had a problem with peeling. I cleaned my glass good to begin with and used Rust-oleum spray paint. Good luck!